Comes with the Real Fyre Real Fyre G45 Glowing Ember Stainless Steel Burner that is made for outdoor use. Leaving a distinctive impression is the name of the game with Real Fyre Woodland Oak Gas Logs by Peterson. These gas logs give that impression thanks to the visually arresting combination of realistic oak bark detail and equally realistic natural oak wood detail where the logs appear to have been chipped. 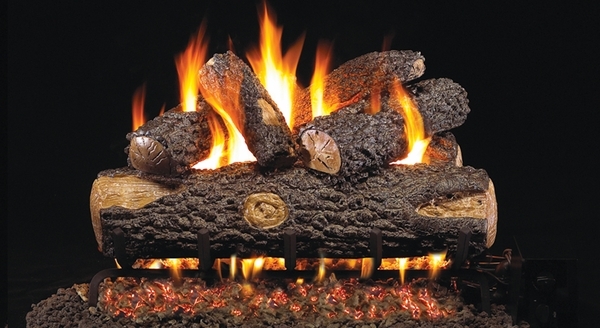 Many gas logs look realistic, but not many offer such a sharp, striking style that sets them apart from the competition. And speaking of separation from the competition, Woodland Oak gas logs feature the superior materials, construction, and steel rod reinforcement used in all Peterson Real Fyre gas logs. Say goodbye to the ho-hum and hello to the best gas log set on the block by placing Real Fyre Woodland Oak Gas Logs by Peterson in your fireplace or hearth today. The Real Fyre G45 Glowing Ember Stainless Steel Burner creates dancing flames and a maximum glowing ember effect. With this cutting edge Outdoor G45 burner, you will enjoy a beautiful outdoor fireplace with dancing flames and glowing embers. Dazzle your family and friends with a beautiful set of fireplace logs in your outdoor fireplace! You'll enjoy many hours and memories gathering around the fire. This log set was purchased to replace an existing set. It is so beautiful lit and unlit. The quality is fantastic. It came with everything I needed for an easy install. I am very happy with it! We absolutely love these logs. Very realistic. The installer commented a few times during installation about the high quality of this log set!